Toronto Dogs Directory: What Does Frank Klees' Decision Mean For Animal Welfare In Ontario? 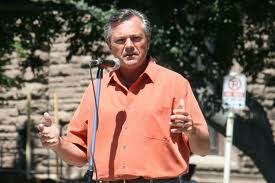 What Does Frank Klees' Decision Mean For Animal Welfare In Ontario? Yesterday, news broke that Newmarket-Aurora PC MPP Frank Klees is putting his name forward to possibly serve as the next Speaker Of The House in the Ontario legislature. While a vote won't be held until mid-November, Klees' decision has created quite a stir in our province's political landscape, First, there are many who feel as though Klees is turning his back on his Progressive Conservatives. This stems from the fact that as it stands right now, the Liberals hold a minority government, outnumbered 54-53. Were Klees to become Speaker, the opposing sides in the legislature would be tied 53-53. What makes this decision so impactful is the fact that with a dead even legislature, Klees himself would serve as the deciding vote on many issues (so many are up in arms as traditionally, the Speaker votes alongside the governing party, though Klees himself has stated that he would vote based on his own feelings toward an issue). Obviously, you don't need to look far to read or listen to thousands of media reports and editorials on Klees' decision, yet what no one has discussed yet is the ramifications that Klees' decision will have on animal welfare issues in Ontario, and especially the OSPCA. As many know, last November Frank Klees introduced a resolution in the Ontario legislature, calling for provincial oversight of the Ontario Society for the Prevention of Cruelty to Animals (OSPCA), and for the organization to separate its status as BOTH a registered charity and an investigative unit within Ontario (I've spoken on this before, but to those asking why this is an issue, I'll pose the question : Would you see a conflict if the OPP decided that in addition to serving and protecting the public, at the same time they became a charity soliciting donations from them?). The resolution had been supported by dozens of MPPs, and THOUSANDS of signatures had been collected from Ontario citizens. In fact, it is my understanding that NEVER BEFORE IN THE HISTORY OF THE ONTARIO LEGISLATURE had a resolution been welcomed with such widespread support. That is, of course, until the majority Liberal party voted against the resolution. Unfortunately, the vote set the clock back a bit from the tremendous momentum toward bettering animal welfare within Ontario. Now, with Klees seemingly wanting to change positions, many are fearful that their most staunch supporter over the last year and a half has left them, and the animals, out in the cold. To those people I simply say, "FEAR NOT!" For starters, Frank Klees has, over the last 18 months, proven himself to be one of the most, if not the most prominent critic of the OSPCA (I say this with all due respect to every other MPP who has pushed for change). Say for instance another resolution demanding reform of the OSPCA is introduced in the legislature, and the voting results in a tie. Which way do you really think Klees will be voting? Though some may fear he would switch his vote (I myself do not believe so), do you really think he would vote against such a resolution - on an issue that he has been fighting so hard for the last year and a half? It is also very important to remember that though Klees has been integral in fighting for changes to the OSPCA, he is not the only MPP speaking out on animal welfare in the province. Just take a look at Cheri DiNovo (NDP), who has long been championing the right of Pit Bulls, and the need to repeal Breed Specific Legislation. As long as there are problems with animal welfare in Ontario, there will be elected representatives to take on the fight. Most important, and what seems to be frustrating me the most, is the fact that many of YOU, as animal lovers, are not giving yourselves enough credit. Do you know what thousands of letters, Facebook groups, blog posts, phone calls, and emails amount to? They amount to the banning on the sale of puppy mill dogs in pet stores. They amount to a ban on Shark fin soup. They amount to every Canadian medical school ceasing the use of live animals in experiments. I do believe that yes, one day (hopefully sooner than later), they will amount to a repeal of Breed Specific legislation, and they will amount to an OSPCA that is transparent with the public, monitored by the government, and will hopefully serve as a beacon for animal welfare in Ontario and beyond. That isn't to say our work is easier or harder. Striving for improved animal welfare in Ontario will always be an unending task, and one that sometimes seems unattainable. But if we keep writing letters, making phone calls, sending emails, and debating the issues, needy animals in this province will reap amazing rewards paw by paw. Please feel free to share your thoughts by commenting on this post and remember, "Why shop when you can adopt?"